I didn’t want to leave before sharing this salad, however, since it’s the first meal I made with ripe heirloom tomatoes from my garden. I’ve had panzanella (a “peasant” meal starring tomatoes and bread that hails from Italy) before, but I didn’t love it: I found it a little boring and the soggy bread didn’t appeal to me. So in this version, I did things differently: I used my favorite hearty multi-grain/seeded bread (which I toasted until very crisp), I loaded the salad up with avocado, raw, local corn and smoked mozzarella, and I served it over arugula. I enjoyed this version of panzanella so much more than the last one. I didn’t have any red onion, but I think that would have made a nice addition. Also, you could add some protein such as cooked grass-fed meat or wild fish, or chopped hard boiled eggs, to the panzanella for a balanced meal in a bowl. 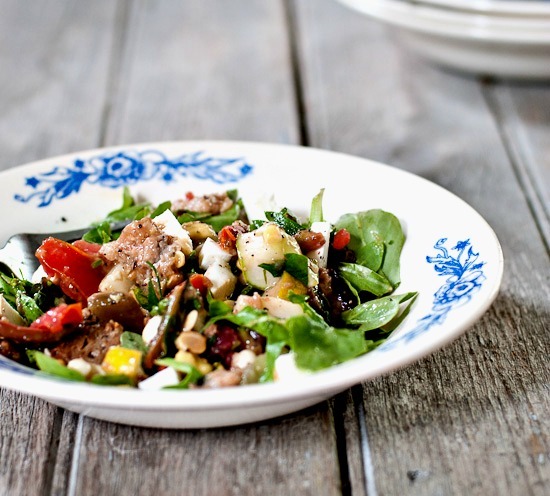 The bread does get quite soft, obviously, but cold leftovers of this panzanella are really good. 1. Mix bread, olive oil, herbs, and vegetables (tomatoes and avocados are technically fruits but you know what I mean) in a large bowl. Gently fold in the cheese, and add fresh lemon juice to taste, if desired. 2. Sprinkle with salt and pepper, then taste so you can adjust the seasonings, if necessary, Serve over arugula or other greens, and drizzle with additional olive oil before serving, if you like. I am planning to have a terrific weekend, and I hope you do, too! Looks yummy. I will have to try it! Isn’t this a lovely thing. Great colors, textures and flavor. A bowl just bursting with goodness. Oh yes please. This looks just fantastic! Looks delicious! 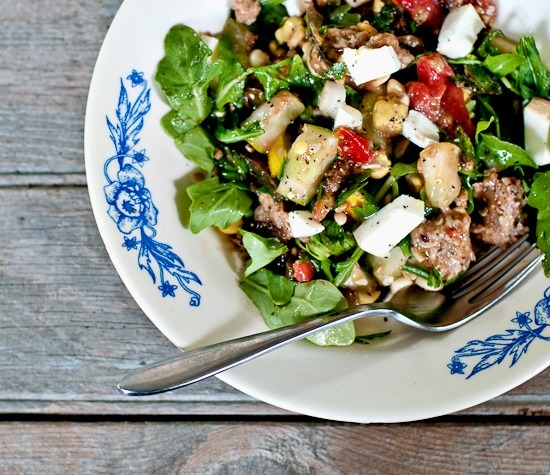 I love panzanella but I love your additions of corn and avocado. That sounds really good and a nice change from how I usually make it! This looks wonderful and the best part is that I have a lot of it growing in my garden! gorgeous photos – love the colors! Ooh this is perfect! 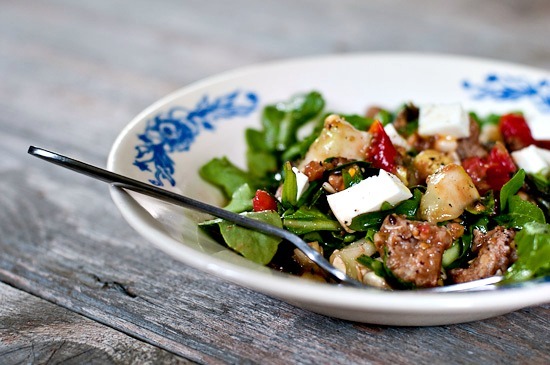 Panzanella is hands down my favorite meal and I am always looking for ways to change it up. Thanks! This salad is exciting! Love the colors and flavors. I’m glad I found my way to your blog – love everything I see here. Nice to meet you!